If like me you associate poison dart frogs with bright colors, then you might be as surprised as I was to learn that this rather drab frog is also a member of that family, Dendrobatidae. Not surprisingly, this frog and other members of the genus Colostethus lack the skin toxins that some other members of the family have. No wonder they try to blend in, especially given their diurnal lifestyle. Colostethus species also differ from other dendrobatids in their association with moving water instead of standing water. Their common name, rocket frogs, refers to their habit of quickly leaping into streams and then drifting away. This one was in fact next to a small stream, but obligingly stayed put. 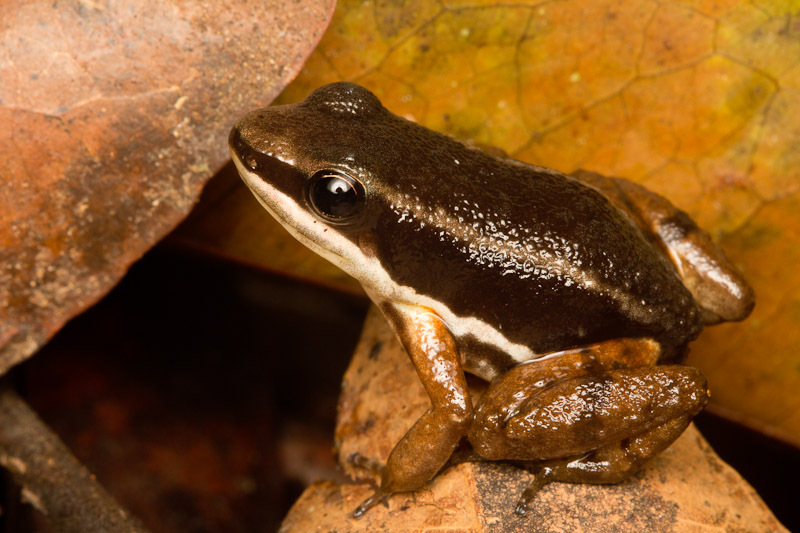 Three species of Colostethus occur in Costa Rica. After consulting several sources, it’s unclear to me which one this might be. My best guess would be C. talamancae because of the lack of an oblique lateral stripe and the presence of dark bands on the hind legs. The two other possibilities are C. flotator and C. nubicola. Stay tuned in the coming days for some pics of this frog’s more colorful family members. I had no idea there were non-colorful, non-poisonous dendrobatids. Reverse engineering of the eye flash gives me a pretty good idea of the diffuser you were using. When are you gonna unveil it? And did you like it? I’m still working on my field diffuser. This was actually version 2. Version 1 only saw studio work. It’s basically a couple of cheap transparent storage containers (the round zip-loc ones), one smaller one nested inside a larger one, each with a layer of rip-stop nylon. The bottom of the containers have a hole that is fitted with a threaded “filter”. The whole thing screws into the MT-24EX like a filter would. I’ve cut off the bottom half of the whole thing as well, at an angle that allows for getting over the top of subjects. Biggest problem right now is sometimes the flash manages to bounce back into the lens, creating a “foggy” image if you know what I mean. I’m not sure why it happens sometimes and not others, but must have to do with how the flash heads are oriented. I don’t feel like I’ve done anything enough to warrant a dedicated post to it. Plus it’s slightly complicated to build (or at least explain how to build). It’s also not as durable as I’d like. It’s slightly bulky, so it mostly hangs on the outside of my bag and doesn’t go in it (which is fine).